Boston Globe coverage of the AFC Championship in Denver. Broncos take their final timeout. Patriots trail 20-18, need a 2-point conversion with 12 seconds left to likely force overtime. 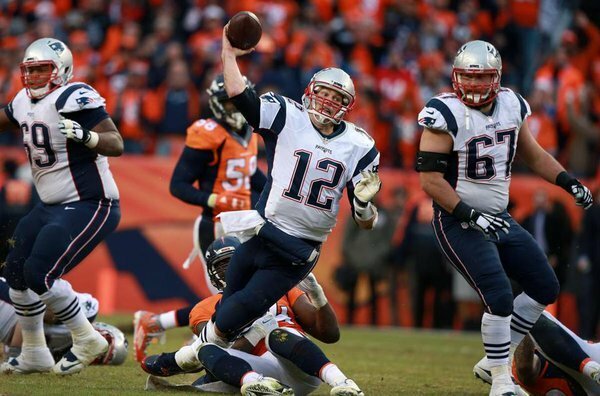 On that drive, Brady completed 3rd 4th-and-10+ of his playoff career and 1st 4th-and-goal pass of his playoff career. 2-point try fails. Patriots trail, 20-18. Onside kick coming up. Game decided by arguably the most dramatic 2-point conversion attempt in NFL history. 1st playoff 2-pt attempt ever w/team down 2 (or 1). Gostkowski: "I feel like I lost the game. I feel sorry for myself, but I don't expect people to feel sorry for me." That was the 8th missed PAT in playoffs since 1994. No missed PAT has ever come in such a close playoff game. Edelman: "You’ve got to tip your hat to them. We didn’t play our best football. They made more plays when they had to. That’s why they won." In Denver and looking for pizza and beer? Go to @HopsandPie . Like now. Awesome. Road teams won the first 4 games. Home teams won the last 6 games. #Panthers DE Charles Johnson on Cam Newton to ESPN: "It's his world. He's MVP. I call him Obama."